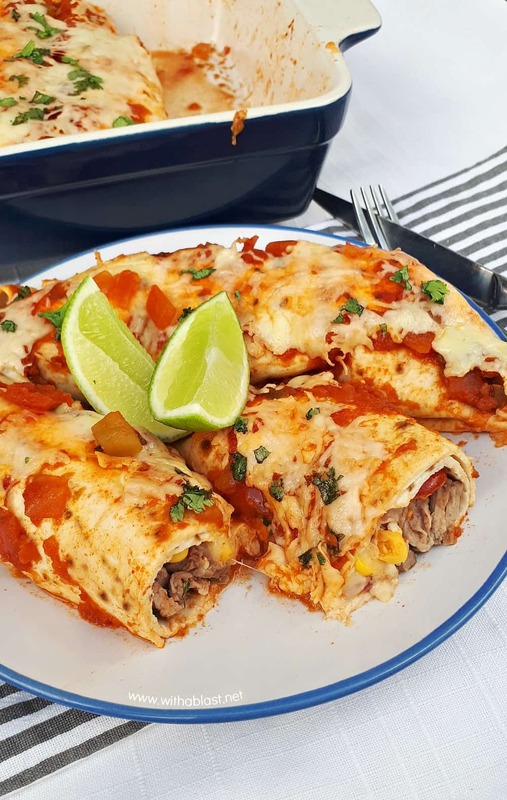 Perfectly marinated Tequila Lime Steak Enchiladas are loaded with steak, a delicious salsa, cheese and topped with chunky salsa sauce and more cheese ! 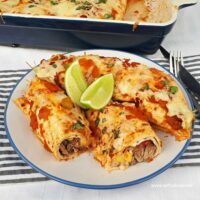 One of our favorite dinners, is most definitely enchiladas ! 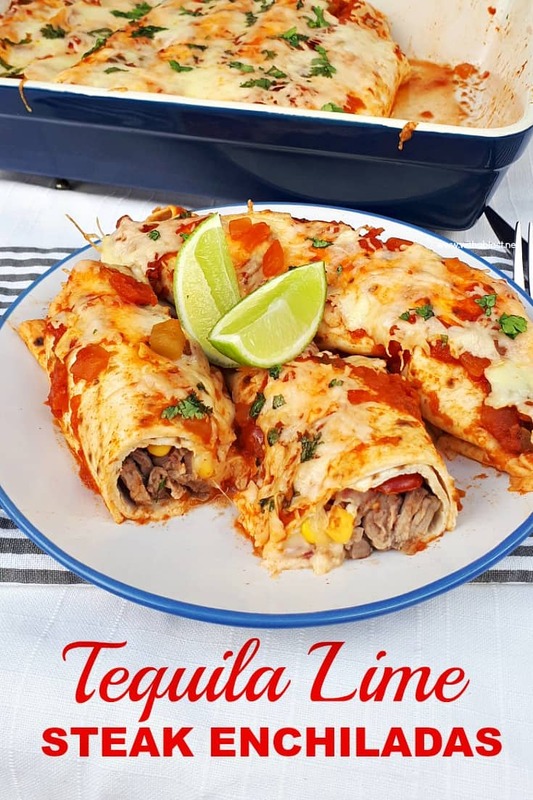 And these Tequila Lime Steak Enchiladas is the perfect recipe to use up those leftover corn and baby tomatoes, which I always seem to have half a punnet left in the refrigerator. 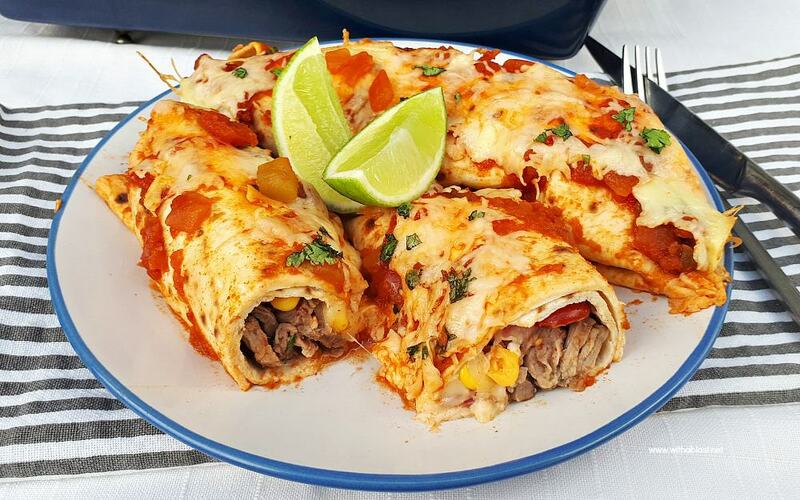 Most of our enchilada favorites normally have chicken as the main ingredient. But as soon as I had made these enchiladas, it was a hit. The Tequila Lime marinade results in the most tender and juicy meat. And so flavorful as well ! This is also my go-to marinade when we have a barbecue and steaks are on the menu. The coarse salsa is a tiny bit different, with the added corn, but a delicious flavor combination. Also, if you prefer a stronger salsa with more bite, feel free to add more chilies. Red and green chilies can also be used together in this recipe. We prefer a milder salsa and one chili is more than enough for us. When I first used chilies in my recipes (way, way back! ), my kids were still little and since then we stuck to the milder side of things. My son-in-law on the other hand,,,, the more chilies, the better ! However, I have to point out one thing – do not skip the Lime wedges on the side ! 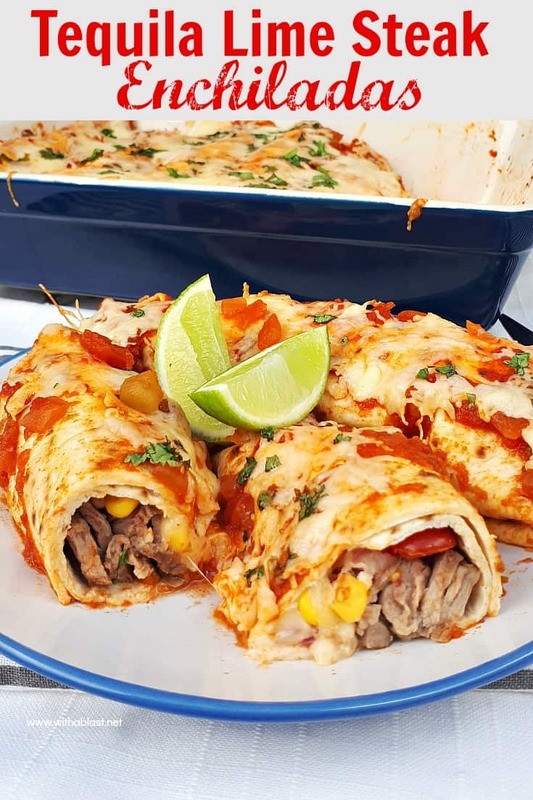 I promise you, it makes these Tequila Lime Steak Enchiladas the winner it is. 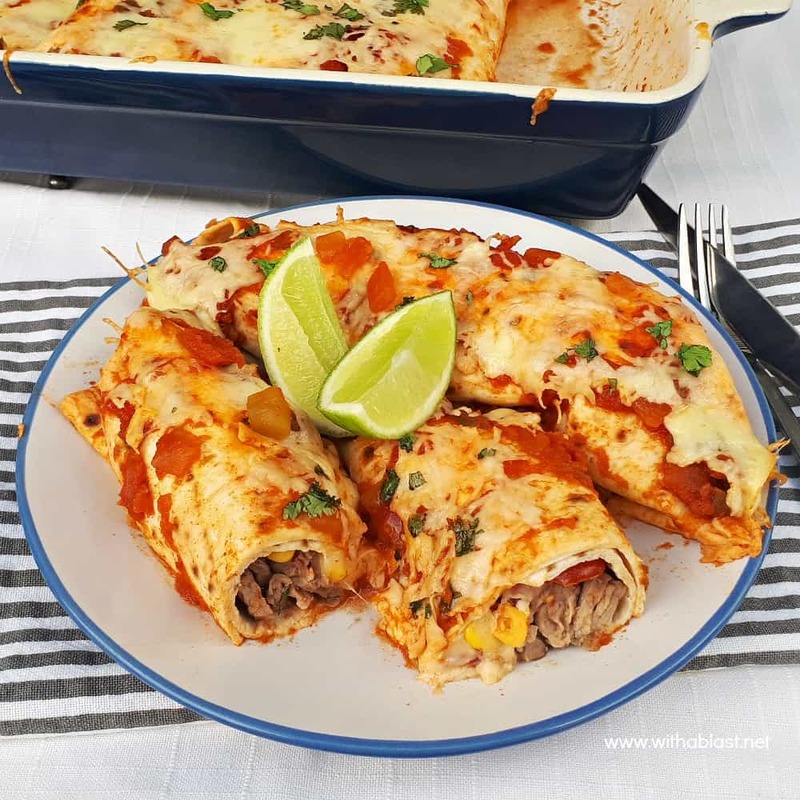 Simply squeezed over the enchiladas and it gives that extra bit of taste as well as bring out the steak’s taste more. And we all know how well Tequila and Lime go together ! It is definitely no longer only a flavor combo reserved for drinks only ! Whenever I marinate meat, especially red meat (and of course tougher meat cuts), I try to marinate for as long as possible. Since I am home all day, I throw together the marinade together and place the meat in a marinating bowl early in the morning. Whenever I am close to the refrigerator, I turn over the bowl. If you are not home all day and either do not have that extra 30 minutes at dinner time, make the marinade the night before and pour over the Steaks. Turn over in the morning and by dinner time, the meat is already done with that part. Good cuts of meat i.e rump, sirloin or fillet, only needs 30 minutes to get soaked in the Tequila Lime marinade.